The QSC PLD4.2 Processing Amplifier from PLD Series is designed specifically for the needs of portable and production sound system users. It provides efficient, robust, and high-fidelity power to drive multiple channels and configurations of loudspeakers while simultaneously deploying sophisticated digital processing with minimal operator complexity. This powerful and lightweight 4-channel amplifier with onboard, advanced DSP has the capability to configure and combine channels in various ways to drive a wide range of loudspeaker systems. The PLD4.2 Processing Amplifier features FAST (Flexible Amplifier Summing Technology) that actively distributes the total amplifier power in various combinations across 1, 2, 3, or all 4 outputs. This flexibility allows PLD Series amplifiers to drive (for example) 4 full-range loudspeakers or subwoofers; a high-power subwoofer and a bi-amplified speaker; a single high-power full-range loudspeaker and subwoofer combo; or multiple power-hungry subwoofers from a single, very high output mono-block. This amplifier uses QSC fourth generation class-D power amp design in combination with a custom power stage utilizing a purpose-built output device. This MOSFET device provides high voltage operation without needing a full bridge output and offers good audio quality due to co-location of the semiconductors. Additionally, it benefits from the PowerLight power supply, further enhanced with PFC (Power Factor Correction) that aligns the current waveform with the AC mains voltage waveform. PFC enables this amplifier to draw current from the wall in an efficient and controlled manner resulting in power from a single standard AC breaker. Additionally, it offers multi-stage sleep modes, saving energy when possible without ever sacrificing performance. The result is a powerful and flexible platform that offers low weight and efficiency. The PLD4.2 Processing Amplifier also doubles as a loudspeaker processor. The close integration of processing and amplification allows the DSP to monitor and respond to amplifier behavior, making dynamics processing accurate and effective. This synergistic approach employs both RMS and Peak Limiters that allow the combination of amplifier and loudspeaker to produce more output without being pushed to distortion or destruction. In addition to the dynamics processing, the onboard DSP offers 4 channels of crossover filters, parametric EQ, and alignment delay - everything needed to optimize a loudspeaker system. The amplifier also offers Intrinsic Correction, a combination of IIR and FIR Filtering and loudspeaker processing methodology. Intrinsic Correction compensates for the non-linearities in loudspeaker array and horn design and results in good performance from your QSC loudspeakers (sold separately). The on-board processing is managed and stored as presets, with 20 factory presets for the most common loudspeaker applications. For great customization, the built-in Preset Wizard streamlines amplifier setup and provides loudspeaker selection of passive loudspeakers (sold separately). 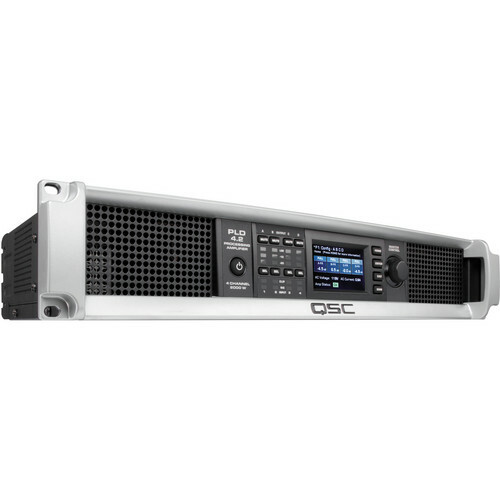 With 4 channels of amplification plus drive rack signal processing in just 2RU, this amplifier replaces equipment taking up as much as 3 times the rack space. With a dedicated front panel UI complete with LED meters and indicators, a 400 x 240 TFT color display, a rotary encoder and ergonomic navigation buttons, this amplifier provides an intuitive interface for the user to control the system. The complete system can be set up in mere minutes. Box Dimensions (LxWxH) 23.2 x 14.5 x 6.6"
If you are using a Powered Subwoofer you do not need a power amp, because the subwoofer already has the power internally. If you could give me some more information on what you are trying to achieve I may be able to help little more I would just need some more details.